Another video of Kiki and Grace taken when they were just a few days old. Our goat house is under construction at the time, so they’re slipping on the plywood floors a lot. 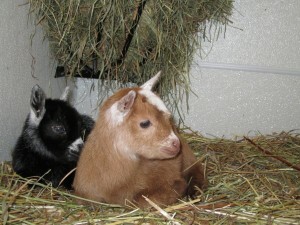 There is nothing much cuter than bouncing baby goats. Towards the end of the video you’ll see each of them drinking their bottles. I had to bottle raise them as their other died from toxemia shortly after birth.